Depending on your point of view, short-term rentals are either a fabulous opportunity for property owners trying to make ends meet on the Central Coast, or they’re nuisances that make it much more difficult for desperate locals in need of affordable housing. It’s a nice place to visit, but people also want to live here. That seems to be a problem with the housing market on the Central Coast. Millions of people from all corners of the world visit the region every year. And lots of people want to live and work here. Those contrary forces have collided, and not with the sort of complementary yin-yang interconnection one might hope to find in California. It’s all a-clash when tossed into the housing blender: short-term rentals and the local rental market and Airbnb and property rights and neighborhood tranquility and making a quick buck and vacation rentals and the cool new gig economy and community standards and surviving in this day and age and affordable housing and mommy, why is that stranger puking in the bushes at the house next door? Not every region has this sort of problem. Short-term rentals aren’t a big issue in a place like Bakersfield. The preponderance of vacation rentals on the Central Coast means that visitors want to spend time here. Visitors are good for the economy. But visitors who take up bedrooms that would otherwise be rented to local employees are not a good thing. Naturally, then, short-term rentals on the Central Coast are lightning rods. Depending on your point of view, they’re either a fabulous opportunity for property owners trying to make ends meet on the Central Coast or they’re nuisances that make it much more difficult for desperate locals in need of affordable housing. A couple of cities on the Central Coast — Monterey and Carmel, notably — have banned short-term rentals from their jurisdictions for more than 25 years. Most other cities are trying to “strike a balance,” crafting ordinances they think will give their residents a chance to participate in Airbnb or VRBO without blowing up the neighborhoods. For many local jurisdictions, these ordinances are works in progress. The Monterey County Planning Commission is in the midst of developing a short-term rental policy in places like Carmel Valley and Pebble Beach. The Pacific Grove City Council will consider an ordinance on Dec. 6. And the Board of Supervisors in Santa Cruz Council is looking at an ordinance today, Dec. 5. In each of those jurisdictions, emotions are running high. Neighborhoods are being mobilized. Petitions are being circulated. Innovative disruptor companies like Airbnb and VRBO have challenged the traditional order of business and governance by creating an organized and global platform for a gig economy. As established, anyone with a spare bedroom can earn decent money without license or interference from the government. Their popularity spawned agitated reaction from those in the hospitality industry. They complained of being unfairly challenged by unregulated upstarts that didn’t play by long-established rules. For consumers, Airbnb and VRBO created a unique allure. When traveling to faraway places, who doesn’t want to hang with the natives? But Airbnb, true to its disruptor reputation, changed everything in cities and neighborhoods. The business model became fashionable in a hurry. Long-term tenants were turned out of homes to make room for short-term visitors who were willing to pay the equivalent of a month’s rent for a week in Monterey. Latest profit-and-loss figures show that Airbnb earned $1 billion for the quarter ending in September, doubling its earnings over the same period last year. The local concerns are three-fold. First, affordable rentals for residents who work on the Central Coast are hard enough to find, harder still now that so many of them are being rented to out-of-towners for short periods of time. Second, unregulated vacation rentals deprive cities and the county of revenue they receive in bed taxes, creating unfair competition on folks who play by the rules. Third, established residents say visitors who stay in short-term vacation rentals can be obnoxious and disruptive. What’s more, representatives from the local hospitality industry say operators of unregulated short-term rentals have an unfair advantage over hotels, motels and legitimate bed-and-breakfast operations that have to obtain appropriate licenses and pay bed taxes. For its part, Airbnb is aware of those issues. But the company believes it promotes a form of “sustainable tourism” that allows more people to travel. Specific to the Central Coast of California, Molly Weedn, a spokeswoman for Airbnb, told Voices that her company helps the state Coastal Act achieve its mandate to allow access to the coast for all by providing affordable alternatives to expensive hotels in the area. “We will continue conversations with the coastal cities and counties in hopes that we can find a solution that allows everyone to enjoy the California Coast,” Weedn said. The company has developed a 26-page “policy tool chest” that guides Airbnb managers in working through issues that come up in different regions. She said Airbnb has paid more than $510 million in room taxes to about 375 jurisdictions globally. Over at the Monterey County Courthouse in Salinas last week, folks were talking about vigilantes — and about scenes that conjure up visions of John Belushi and Animal House. The county planning commission was churning through some vision of an ordinance it expects to craft that would regulate short-term rentals in areas of the county outside cities, in places like Carmel Valley and Pebble Beach. Nobody seemed happy with the draft devised by county staff. People who own existing short-term rentals believe the new ordinance is too complicated, with too many regulations and too many application requirements. Certain vacation rentals would need full-blown use permits, for instance. And neighbors who oppose short-term rentals were furious that the county was considering even a Draconian version of an ordinance; they pretty much want STRs banned completely in residential communities. But neighbors say they’ve had it with unruly visitors. They describe living next to homes that are filled with loutish, drunken visitors who, according to one neighbor, “hoot and holler” through the weekends. “If I live in a residential neighborhood, I expect a residential atmosphere,” added Rick Aldinger of Big Sur. Jan Leasure, who represents the Monterey County Vacation Rental Alliance, asserted that local hotels and motels are pricing middle- and lower-income visitors out of the area. “Our tourism is concentrated on the very affluent,” she said. “We are becoming a retreat for the elite.” STRs provide a cheaper option for families of modest means to enjoy the region, she said. The Alliance is a member organization representing property owners who rent their homes to visitors. But Gary Cursio, who represents the Monterey County Hospitality Industry, said the Airbnb-type operators are taking workforce housing out of the market. And he complained the hotels, motels and restaurants he represents are unfairly disadvantaged because STR operators aren’t required to comply with the Americans with Disabilities Act or commercial food preparation guidelines. It’s evident that it will be some time before Monterey County comes up with an ordinance to regulate short-term rentals. Staff planners were seeking guidance from the commission — that’s what last week’s meeting was all about — and a final draft of the ordinance will need to be vetted through public hearings before it’s sent to the Board of Supervisors. Not only that, the planning commission purposely excluded all of Big Sur from STR ordinance consideration until Jan. 10. Until several weeks ago, many Big Sur residents were sealed off from the rest of the county for months due to the closure of weather-damaged Highway 1, and the commission wanted to give those residents more time to work through the issue. Regardless what the county ultimately decides, it’s likely to be challenged by one side or the other. There’s already talk of litigation. There’s already talk of a countywide ballot measure to enact an outright ban on short-term rentals in residential neighborhoods. About a year ago, a young man with business on the Monterey Peninsula opted for a room he found in Monterey on Airbnb. He was the sort of upstanding young man you don’t mind seeing in your neighborhood. We ran into him one morning, standing outside the home and looking a bit dazed. He told us the online Airbnb advertisement mentioned views of the Bay from an historic old Monterey home. What he found when he arrived was a ramshackle house that had earned its historic designation only because nobody had done anything to upgrade it in any of the decades since it was built. There were no views, he reported, the house reeked of cat urine and he was abruptly awakened from his sleep by a serenade of chickens pecking at his window. The good news is that the house is no longer listed on Airbnb. In fact, if you do an Airbnb search for a place in Monterey, you won’t find much. The city has cracked down on its enforcement of vacation-home violators. If anything, Monterey has been a local pioneer in the fight against short-term rentals. The city banned STRs in 1991. It was an issue 26 years ago, when city residents made their homes available to visitors here for golf tournaments, Laguna Seca races and other special events on the Monterey Peninsula. There was a lot of local talk about making a quick buck by renting their homes to big-money golf fans who would be showing up for the U.S. Open at Pebble Beach in 1992, and the city wanted to nip that notion in the bud. But the ordinance was only enforced if neighbors complained, according to Hans Uslar, assistant city manager. About five years ago, the city council increased penalties from $100 to $1,000 a day after it became clear that some property owners simply factored city fines into the fees they charged visitors. But when Airbnb got popular, residents and city officials started to notice many more out-of-towners creeping into neighbors’ homes. By unanimous vote, the Monterey City Council earlier this year adopted an ordinance that strengthened its original prohibition on STRs by imposing fines on property owners who advertise their homes or vacant rooms for short-term rental. And the council also authorized its staff to enforce the ordinance vigorously. City enforcement officers now scour sites like airbnb.com to root out violators. Get caught the first time, the fine is $100. After that, the fine increases $50 with each violation. At this point, city officials are trying to determine if their enforcement efforts are opening more available rentals for people who work or go to school in Monterey. “We’d like to see the long-term rental market open up to students and hospitality workers,” Uslar said. He noted some anecdotal changes. For instance, a recent posting on Next Door Old Town in Monterey announced that a home was being converted from a 5-star Airbnb rental to a full-time lease. Santa Cruz, like Monterey, is a historic vacation destination. But Santa Cruz visitors tend to be day-trippers, and the city has far fewer visitor lodgings than Monterey. And until recently, the presence of vacation rentals in Santa Cruz was uncontroversial and nearly unregulated. Before 2016, Santa Cruz didn’t regulate vacation rentals except to demand payment of the city’s Transient Occupancy Tax (TOT), which currently amounts to 11 percent of the room rate. But the arrival of the sharing economy, combined with the soaring cost of coastal housing, quickly elevated the issue to a furious debate. The key question was whether short-term rentals were displacing long-term rentals, in a city with a critical housing shortage. There were also concerns about parking and neighborhood disruption, already common irritants in a university town with numerous student rentals. In October 2016, Santa Cruz placed a temporary moratorium on new vacation rentals while officials sought public comment and studied the impact of STRs on long-term rental housing. A year later the City Council approved a compromise designed to protect long-term rentals and allow a limited number of city residents to host visitors in their homes. The ordinance is awaiting review by the state Coastal Commission, and city officials hope it will be approved before the moratorium expires on May 31, 2018. The Coastal Commission is charged with preserving access to California’s coastline, and tends to favor rules that result in affordable visitor lodging. The Santa Cruz ordinance makes a key distinction between “hosted” STRs, where the homeowner is on site and offers space in the home, and “non-hosted” STRs where the owners live elsewhere, and guests occupy the entire unit. Hosted STRs are favored by the ordinance, as they do not displace existing rental units, while non-hosted STRs are discouraged. The ordinance would grandfather in existing STRs but ban new non-hosted rentals, and eliminate most existing non-hosted rentals by attrition, over time. The ordinance would allow up to 250 hosted STRs in Santa Cruz, with existing units having priority and the rest permitted on a first-come, first served basis. Home-swap arrangements would be exempt from regulation, and STRs would not be allowed in legally-restricted affordable housing or accessory dwelling units, except for a handful with permits obtained before November 2015. The city sought a middle ground that protected rental stock, and allowed law-abiding homeowners to host STRs and earn income on the side. Those STRs will also provide TOT revenue to a city that has long sought to build new hotels. The city of Santa Cruz currently offers 2,090 visitor rooms, compared to 4,664 rooms in the city of Monterey. Countywide, the numbers are even more lop-sided. Santa Cruz County provides a total of 4,637 rooms, while Monterey County offers 11,976, according to statistics from both counties’ visitor agencies. These numbers include hotel rooms, bed and breakfast inns and vacation rentals managed by agencies. They do not yet include rentals listed solely on online platforms such as Airbnb. Santa Cruz County also draws a distinction between “hosted” and “non-hosted” vacation rentals in homes outside the cities. It regulates all non-hosted rentals under longstanding whole-house vacation rental rules. Whole-house vacation rentals in desirable beachfront neighborhoods have long been blamed for reducing housing options and plaguing residents with parking conflicts, loud parties and other bad behavior. Existing county law limits the number of whole-house vacation rental permits and applies strict licensing rules. The county is now drafting rules for hosted short-term-rentals, with a proposed ordinance going before the Board of Supervisors on Tuesday, Dec. 5. The rules would cover hosted STRs in the county’s unincorporated areas, including communities like Aptos and Soquel.. The proposed ordinance would limit the numbers of days that homeowners, and a handful of grandfathered-in renters, can rent spare rooms to visitors in a year. The total number of permits would not be limited. Hosts in most of the unincorporated area would be allowed no more than 110 rental days per year. Hosts in three specific neighborhoods –— Pleasure Point, Seascape and Davenport — would be limited to no more than 55 days per year. STRs would also have to obtain permits, pay fees, and meet parking, occupancy, noise and other standards. Supervisors will consider the proposal Tuesday, and any ordinance they move to adopt must eventually also pass muster at the Coastal Commission. The city that promotes itself as America’s Last Hometown has learned it’s not easy to strike a balance between maintaining its hometown character and accommodating visitors. Pacific Grove is currently working on its third version of a short-term rental ordinance. By most accounts, it’s easier to get a house in Pacific Grove licensed and operational as a short-term rental than any other jurisdiction in Monterey County. The city has developed regulations and limits on the 250 units it allows as STRs. But members of the Monterey County Vacation Rental Association believe those rules aren’t as onerous as those in other cities in the region. But some residents of Pacific Grove complain that most of the homes being rented to visitors are owned by out-of-towners and that the city is doing a haphazard job in policing the rentals. Unlike Monterey, Pacific Grove has given property owners the chance to rent homes or rooms to visitors since 2011. The ordinance was rewritten about four years later in response to the explosion of Airbnb-type operations in town, said Mark Brodeur, P.G.’s community development director. And city officials are now reviewing it yet again, to work out issues they didn’t foresee two years ago. The city has offered three types of licenses to homeowners. Type A licenses allow people who don’t live in the house they own to rent the house for 90 days or more each year. Type B licenses allow people who live in their homes to rent their home for fewer than 90 days when they are gone. And a “home-sharing” license allows owners who live in their homes to rent spare bedrooms for an unlimited number of days. The existing ordinance also limits the number of STRs that can operate on any given neighborhood block. With a 15 percent block restriction, that means that in a standard city block of about 40 homes, six of those homes could be rented to visitors. The problem, Brodeur and some neighbors have discovered, is that sometimes, by happenstance, those STRs can be clustered near one another. So a neighbor could end up surrounded by vacation homes. The city is now considering what Brodeur calls a 55-foot zone of exclusion, which would exclude owners of properties within a 55-foot circumference of an existing STR from receiving a license. And, yes, it’s this level of detail that can propel bitter controversy when it comes to the short-term rental issue. Because some people in Pacific Grove are livid. At issue is an announcement, made during a council workshop on the matter on Nov. 13, that current vacation-rental property owners will not lose their STR licenses, even if they are located in one of the forbidden Bermuda Triangles of Exclusion. Brodeur points out that, unlike most jurisdictions, Pacific Grove issues licenses to short-term rental operators, rather than permits to property owners. He said the difference is important because it’s easier to pull a license from someone than it is to reverse a permit. Also, a license goes away when a property owner sells the property or dies, while a permit can be transferred during a property sale. As a result, Brodeur said, the problem clusters will eventually disappear naturally, through attrition, and anyone who buys or takes control of the property after the original license holder is gone will be tested against the 55-foot zone of exclusion. The council is scheduled to consider the revisions to the short-term rental ordinance on Dec. 6. By the way, Brodeur said the city aggressively goes after property owners who use their homes as vacation rentals without getting licenses. He said the city has fined at least two dozen violators in the past two years, including a habitual scofflaw that was eventually fined $90,000. Other cities around the Central Coast take a variety of approaches to vacation rentals. At least two of those cities — Marina and Seaside — are in the midst of drafting ordinances and policies now that the popularity of short-term rentals has spread into those jurisdictions. She said enforcement of the city’s STR policies is by far the department’s biggest code-enforcement issue, representing about one-third of all actions taken by enforcement officers. Most violators are reported by neighbors, she said. Over in Carmel, the city prohibits virtually all visitor-serving accommodations in areas of Carmel zoned residential. It’s really quite simple, actually. “In order to preserve Carmel-by-the-Sea’s residential character, no home or subordinate unit may be rented for less than 30 consecutive days,” according to the one-line explanation on the city’s website. Fines are levied for each day homes are used as STRs. Carmel’s ordinance was enacted in 1989 and has been in force ever since. As it turns out, keeping up with innovative economic disruptors has become a cottage industry in itself, and Carmel has turned to a company called Host Compliance to monitor short-term rental activity in town. The company keeps track of and enforces short-term rental policies in individual jurisdictions. It was founded only two years ago, and its clients are spread from Durango, Colo., to Indio. Carmel spends $11,000 annually on its contract with Host Compliance. So, if you go to airbnb.com and run a search for vacation rentals in “Carmel,” you’re more likely to be directed to dozens of bargain homes in Carmel, Indiana. 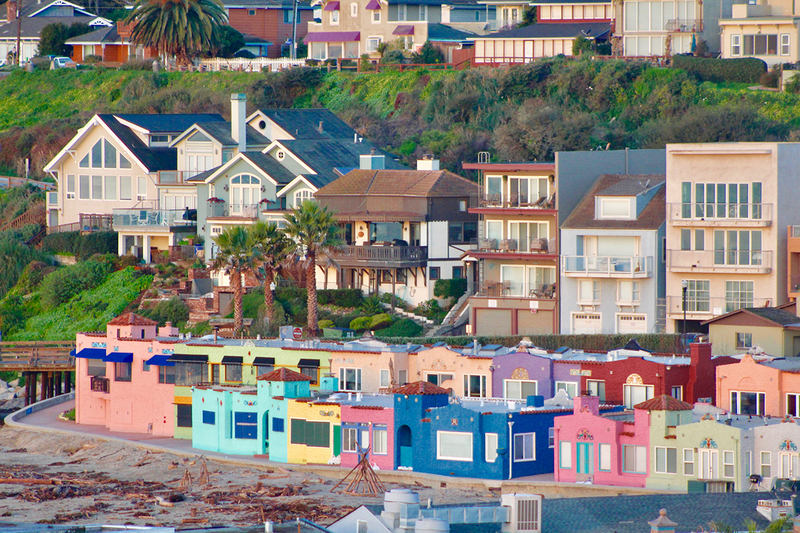 In Marina, proximity to beaches (albeit cold beaches), to the Monterey Peninsula and to CSU Monterey Bay has generated growing demand for short-term rentals. For Marina city officials, vacation rentals in the city are an untapped source of transient occupancy taxes. At present, the city has no ordinance and no ability to collect those bed taxes, but city staff and planners are working on it. The Planning Commission has held several workshops in the past six months, but has not yet determined exactly what will be included in the ordinance, according to J. Fred Aegerter, community development director in Marina. One thing is certain, though. The city of Marina will certainly not ban short-term rentals from the community. Instead, city officials hope to give preference to people who live in Marina, as opposed to absentee homeowners in some of the newer developments. And they are working on a formula that would limit the number of short-term rentals on each residential block, Aegerter said. Seaside currently has no regulations, but the city council has recently launched an effort to draft an ordinance. The council last month gave preliminary approval to an ordinance that would allow up to 200 short-term rentals in the city, and that would require property owners to seek annual permits from the city. The proposed ordinance would require vacation-rental operators to collect room taxes, and 25 percent of the revenue collected from those taxes would be set aside to help create low-cost housing in Seaside. Maria Gaura contributed to this report.